All parks are not created equal. Wahoo Creek Park on Lake Lanier doesn’t have all the amenities you’ll find at Don Carter State Park, for example. Wahoo Creek Park has one of the smaller boat launch areas you’ll find on Lanier. On the other hand, this park is a favorite for crappie fishing and for reaching secret fishing holes — if your boat will fit under the weensy bridge on Mt. Vernon Road. If you can squeeze under the Wahoo Creek Bridge, head upstream on Wahoo Creek to find bass that are lonely and waiting to strike your bait. 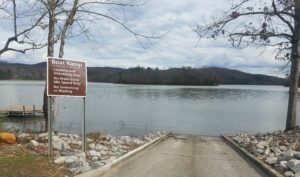 Yes, Lake Lanier was constructed in the early 1950s to provide flood control, power production, drinking water, boating, recreation and wildlife management. Stop by Wahoo Creek Park some evening and see for yourself that Lake Lanier was also created for outstanding crappie fishing from shore. Every park on Lake Lanier is perfect … in its own way. Wahoo Creek Park is located at 3956 Mount Vernon Road in Gainesville, a few miles south of North Hall High and North Hall Middle Schools, and about a mile from Thompson Bridge Road. I’ve been trying to find Weensy bridge on Mt. Vernon rd. but cannot find on google maps. Where is this bridge? Thanks. The Wahoo Creek Bridge (aka the Weensy Bridge) is just over one mile northeast of Route 60 on Route 283, on the way to North Hall High School on Mount Vernon Road. Easy to find, hard to get a boat under.